witchcraft & magic | QuantumPhoenix.net – Esoterica, Paganism & Ritual Magic. From 3.30pm, gather in the back garden/ patio area of The Woodman’s pub..(corner of Archway Road) ..few minutes s from HighGate tube (north london). We’ll leave at 4pm in a candle lite procession to woods.. for ceremony. This is an open ritual held in an outdoor park/woods with easy public access..
Out ritual *Team will conduct key aspects of the ceremony, with plenty of opportunities for everyone to get involved in the actual ritual – ie with elements calling, chants, magical work and so on. Example: Plea to Winter Goddess to leave. We’ll return to the Pub after ceremony in woods, to carry on socials as usual till late. So you want to get Initiated? Article originally written on 9th March 2012. eBook `Coven Guide: How to become an initiated Witch’ published on 13th November 2012. So you want to get initiated? Here are important elements of preparations to bear in mind. You are seeking initiation, or are just interested or curious about initiations (non-initiate). You are against initiations and want materials to argue against (non-initiate). You have been initiated already (or you have initiated others) and want to know what I may have to say. All of these supposes that the `initiation’ we are talking about (about to) is one of those formal, human engineered initiations. That is to say – one that is created by one or more Priests/ Priestesses for the purpose of an individual going through them. It can be pat of a solitary working, or as part of joining a Wiccan/Witch coven. (Discussions and thoughts about differences between Wicca & Witchcraft are found in another article, so I will use those terms loosely here). Let me address the second category first! 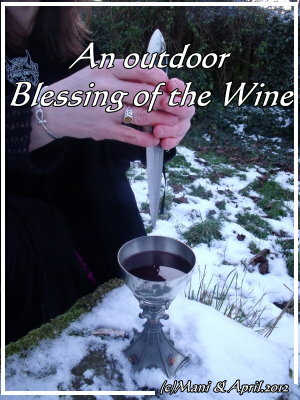 Whatever I am writing in this article comes from my personal experiences of about 15 years of participating in initiatory Wiccan covens in the UK. I have also initiated a number of people into Wicca. I am qualified to write about my experiences and thoughts, and opinions. And before anyone jumps on the matter of me revealing `secrets’ of initiations, they really should just visit a big bookshop (for real) and browse through the shelf on wicca / occultism – because hundreds of other people have written about it all. Even novices who have never run a coven or initiated others and taken responsibility for guiding others, seem to write about Wicca these days. If you are one of those who has been initiated recently, then this article may have additional insights for you. You really should book time with your initiator(s) soon to go through your experiences, insights, questions and thoughts on your personal experiences. It is a valuable meeting that will benefit you, and them! Gone are the archaic days where initiators act like walking-gods (or Dictators) and `ride’ their initiates hard. We don’t put up with that sort of behaviour in the modern world. Ancient or modern, initiations and the people involved reflect and must also move with the times. Hierarchy that worked 200 years ago in ancient Greece or even covens in 1950’s just won;t be applicable in the modern era. Coven leaders used to `give’ the `witch name’ to their initiates at initiations in the early covens of 1950’s, 60’s (or even in recent times). But this is something I personally do not agree on! Leaving aside arguments and logic-chopping about Fatalists and what’s `fated’, my insights on the matter is that- the first conditioning we human beings ever get from the moment of birth (or even before) is our very name! We don’t choose it. Our parents, relatives, guardians, foster-parents, social service officers, adopters and others name us! And we grow up with the energy of that name that has been given. And unless you are one who chose to change your name legally by deed-poll, you are still bound by that conditioning. And choosing your own `witch name’ or identity is possibly the most liberating and empowering act one could ever do! So if an initiator is going to give you a name, then they are not giving you freedom, but more slavery! And in any case, freedom can not be given. It is a right, and when it fails, it must be taken! Let’s get back to initiations! And the first category of people reading this: You are interested in, or are about to go through a Wiccan initiation. If you are about to go through one that a coven or individual is preparing for you, then I hope you have had plenty of time to think about and explore your reasons for this. Why do you want to be initiated? Are you fully aware of the expectations the coven or that initiator has from you, once you go through it? Practising Witchcraft and/or Wicca does not require one to be initiated into a coven or wicca by others! Once you embark on that path, or awaken to that path by a series of coincidences and synchronous events, initiatory experiences start happening for you! I guarantee that!! It may be little things or big life-splitting events! There will be challenges, hardship and difficulties, in equal measure to all the harmony, depth, spiritual insights and rewards. (but most humans tend to only notice the `problems’ ). What I am trying to say here is that fate itself (and the Gods and Goddesses) will put you through initiatory experiences! You don’t need a man or a woman in a Priest/ Priestess /leader/ guru role to do that. So why do you want to get initiated? To learn more; to get deeper wisdom; To serve the world; To teach others… Ah, the responses are endless and many. Trust me, I’ve given many of them myself (I went and looked at my old magical diaries of pre-initiation days!). Some of those responses make me shrink with shame and embarrassment. Oh, no one else has seen them, but I know. It’s amazing how I was trying to pull the wool over those Gods of mine! Oh, they knew all along, am sure, like a parent who can see through the lies of a young child. So I ask again – Why do you want to get initiated? Be utterly honest with your self now. Write it down. 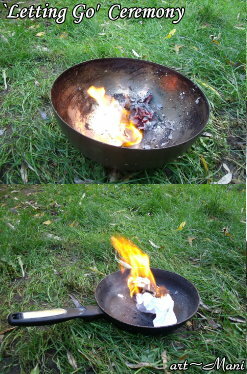 And them read what you wrote, and burn it if you have to. But be honest 100% with your self. Then, if you have to, go ahead and create those `other’ reasons which everyone else will accept and applaud you for! Am I being harsh? Yes, probably. Okay so let me ease up a bit. Reasons – real ones – for initiations vary. Here are some perfectly valid personal reasons. Initiation is attractive and scary at the same time. (mystery of the Craft). Initiation is (currently) the only way for you to join a coven or a magical group (joining a group). (there are training groups you can join and explore spirituality & magic, without getting initiated, by the way! I know, because I myself have run many of them). It’s a deep-rooted calling and you just can’t explain it (intuitive). Serious magic can only be learnt after initiation (or so you believe). Your friends / partner have been initiated – and they either want you to be initiated, or you don’t want to be left behind. You are writer / Journalist, looking to learn some things and then write about (this has happened many times!). Warning: Many who start off this way have ended up `really’ being pulled in to the mysteries and become `genuine’. Initiation is a door and anyone who walks through it –be in genuine Seeks or attention seeking Fools – are going to find their lives transformed sooner or later for real! Gods can wait a very long time!! Expectations of your initiator is something you must be fully aware of – so please have a good long genuine discussion. Coven leaders and initiators are not gods or goddesses (unless you fancy them that way, in which case, you should read my article on `Sexuality in Wicca & Paganism’). You should be able to sit and talk to them freely. By all means, learn from them, and respect them, (and even love them), but for Heaven’s sake, don’t get into the pit-fall of putting them on a pedestal (even if they want that!). So talk to them – about what they expect from you, once they have initiated you into Wicca and/or their coven. Initiations have many purposes – one of them is joining individuals into the group-mind magically. Initiations are not to be treated as one-night-stands in wicca! It’s a long-term committed relationship – between you and the coven. Most initiators in Wicca will expect you to attend coven and coven socials regularly, and for long periods. We are talking about at least the 8 festivals, a number of full moon/ new moon rituals (total of between 12- 20 rituals per year), training sessions and/or meetings (once a month – either in coven set-up or as one-to-one with your initiators) and of course coven/group socials – where members meet together at coven-home, or meet-up and go to pagan events, moots, festivals etc. These things may not be exclusively stated or even expected – but trust me – there is highly likely to be these expectations. Initiators expect the people they initiate to stick around, working magically with them and coven for a good 3-4 years. In that time, they not only teaching and training them, but also investing their magic, hopes and ideals in their initiates. It is all about passing on knowledge and wisdom. That is part of the magical contract. And that is also how the wiccan lineage and magical current continues. Not many people actually talk about this, possibly for fear of new Seekers becoming afraid of commitment and never joining. But it’s best all around to be clear from the start. No point joining a group, then giving the coven and initiators the run-around with excuses and explanations as to why one could not attend a meeting. Once pr twice is fine, but when ongoing, it shows a deeper lack of commitment. And there is that magical axiom – As within- So without. If life keeps throwing distractions at you and stops you going to coven, then, the question to ask is – is it fate that’s manifesting those distractions, or something deep within you?! That brings me to another core ideal in magical traditions. Know Thyself! And be mindful of what you are thinking- feeling – doing – sensing – at all times. It’s not easy. It’s hard at first. It may feel like you mind doesn’t stop. And that you are `on-call’ all the time. But this phase will pass, and you’ll learn to be `normal’ about being so mindful. For example, as a Physicist, I am always aware of forces and material limitations of the objects around me. And as a magician, I am aware that I am sensing (esoteric) energy all the time, but learning to either ignore some or tune into to some more actively. It’s a bit like noise in our world. If you are in towns and cities, you hear what we call `background noise’ – it’s a collection of all the sounds that are going on. We learn to ignore them, but can also choose to listen to specific sounds. (Mothers are well-tuned to crying babies. Their own, or even other babies). So returning to the point- Know thyself & Mindfulness are important. We’re just scratching the surface – but am sure you can begin to see the depth and seriousness of initiations. Initiations are not just rituals you do, it applies to articles and books too. In these preceding sections, I’ve been preparing you for the main matter of initiation. Taking you through all sorts of hoops!! Well done for sticking with the reading. And if you just skim-read this, you really should know. I write non-fiction like fiction. I plant clues, and I write like a mystic, in cryptic clauses too. So you should read this article at least a few times, to gain maximum insights from this. That said, let’s get back to initiations. Here are some serious considerations and questions you may (and should) be asking your self, once you’ve decided that Wiccan / witch initiation is for you. I’ll also add the insights for each one. Did you ask for it? This may seem the most ridiculous of all questions. But in Wicca and in any initiatory mystery pagan traditions, a Seeker must take personal responsibility for his or her own path. And if you want to be initiated into a coven, or by someone who is an experienced Witch/priest/ priestess, you have to approach them – and ask for it! Most self-governing and honourable Coven leaders/ Initiators will not approach you and `offer to initiate you’. (If they do – run!). No matter how well you know someone, and no matter how much hints you drop, or how many hints they may drop, the clinching point is – you must gather your wisdom about you, and ask them to initiate you. Is it about you or the initiator? Short answer- the moment a seeker decides to go down the path of formal initiation, it becomes about that Seeker- ie you! The would-be-initiator may give you all sorts of explanations, but ultimately, even though they are the initiator(s), the journey, the need and quest is all about you! And they are then-onwards there, in your life, to aid your learning. How do you get to know the would-be-initiator(s)? This is the easiest one to answer, yet hardest to achieve. It’s got to be a gradual process, and you have to make the effort, unconditionally! You have to ask for either time with them – formal appointments to go and chat with them, or invite them to socials (group social and/or personal) where you can converse. In addition, you have to `hang-out’ with them, by going with them to some pagan festivals, events, conferences, pub socials, open rituals etc. Don’t end up stalking them by finding out about where they are going and always turning up to the same events. Everyone needs a bit of personal space. Even would-be-initiators. So just go to a few of the events. Once you have expressed a desire to `work magically with them’ they would know you are going to do this, so don’t get too sneaky about it. Be open. You don’t have to turn up every where they go. But you are best advised to turn up at least to the Open rituals, socials and other events that they may actually organise, or publicise, as one they are going to. It’s likely a hint that they are giving you an opening to socialise with them. Be genuine and civil with them (but no bribes of excessive gifts!). Do they have experience? This may seem obvious, but – do they? These days anyone can `gain knowledge’ by reading a number of books, and set themselves up us some sort of coven leaders or initiators. But a genuine Initiator should have had a certain number of years experience being in a coven to learn and train to be a Wiccan, and ten undergone further training to become a self-contained coven leader (and an Initiator). In the old days (30-40 years ago), in some wiccan lineages, Witches spent a year as Initiates, and then were given their `2nd degree’ – as a High Priest or High Priestess, and thus were `validated’ as Initiators who are qualified to teach, train and initiate other seekers. In my opinion, this is not enough time. It’s like a novice learning to drive. Even after learning and passing a driving test, they the need `real life’ driving experience for a long period – before gaining expertise to be able to drive in motorways, highways and especially teach others. So why and how could someone become so competent in just 1 year to be able to teach or initiate? People generally go through a plethora of psychological and magical processes in their own rights. Sometimes time must pass, for experiences to sink in and become wisdom. As with would-be-initiators. Not only must they have `done time’ as seekers and initiates, but they mist also have spent time learning to teach, train, mentor and ultimately initiate. And here’s a pearl- someone who is very good in managing a team of 20 people in a business is not necessarily going to be good in training a seeker in magic. An expert in looking after pets isn’t necessarily an instant-expert in looking after a young child. The approach and psychology will be different. Not many talk about this, but once a person indicates they are seeking training and/or initiation from an Initiator (coven leader), and that initiator agrees, a magical contract exists! Dating is possibly a good analogy to explain this. In early stages (when one is footloose, wild and single), one may socialise with many would-be romantic partners, and at a certain stage, may even go-out with more than one person to explore compatibility. But then comes the committed relationship stage- where the person develops a relationship with only one person (unless they were `promiscuous’). In Wicca, when one has asked for training and a coven leader(s) have agreed, it’s a committed relationship. In romantic life, often committed relationships lead to marriage, so in wicca, a training relationship leads to initiation. Of course, relationships can fail, and engagements can break. Same in wicca. Sometimes, after a while, training relationships can break, because the Seeker and would-be initiator may find that they can not work together magically in the long term. There are many reasons why this can happen. Their personalities do not gel better, and one or neither are willing to work to over come this. The Seeker looses interest, or can not maintain commitment and exclusivity in working magically with the Coven leaders. One or both parties move residence – to a location too far for travel and training in the long term. The boundary between Seeker and trainer is breached, and quite possibly dependency, projections, or worse a sexual relationship may have developed – which in turn makes the training relationship incredibly difficult for both. So assuming you traverse all these issues well and carefully, you will be on course for your initiation. Of course there are many more stages in between this and actual initiation. We’ve only been covering the psychological and logistical aspects here, so far. There is the whole magical development to consider – the Quests, knowledge, practise, preparations, tools, name, interactivity with would-be-coven members (or other initiates), where it all takes place, and the secrecy itself! Yes, there is the issue of secrecy! What next? I can’t tell you, not because I am bound by some secrecy (well that too), but because what follows will be unique between you and your would-be-initiator(s). If you have any questions, feel free to write to me – either as comments below, or as private messages . I’ll answer – as much as I am allowed to answer.. (without breaching the Wiccan secrecy oaths I have taken). May your path be full of challenges you can conquer, and wisdom you can uncover. And may your deities always watch over you. Witchfest is an annual Gathering/ Indoor Festive event/ convention (in it’s 11th year). It is currently the largest Witchcraft Event held in the World, and takes place in Croydon, (South London) on the Saturday 15th November 2014. These events are organised by `Children of Artemis’. I started attending these from about 10 years ago – having been going to monthly pub moots and conventions- either as a Speaker/ Workshop facilitator, or just as an ordinary paying attendee. 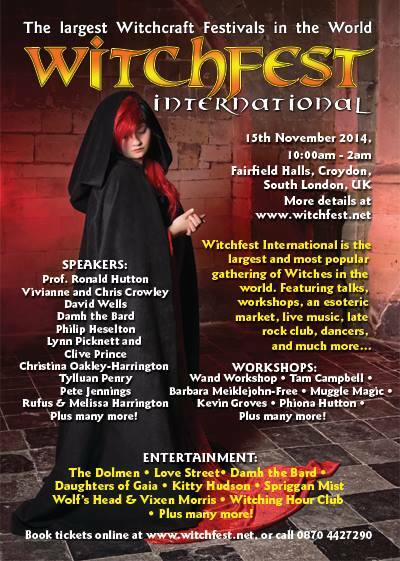 Few years ago, I co-manned a stall for `Pagan Federation London’ at the Witchfest. Gossipers & Nay-sayers have in the past branded Witchfest events as `jumping in on the witchy bandwagons of popular TV shows such as Charmed & Buffy the Vampire Slayer of the 90’s. Others have smirked at it as just being full of teen wannabe-witches coming in their crushed velvet fancy dresses. However, a look at any (past and present) scheduling will show – Witchfest hosts some very impressive talks and workshops by many of the leading and experienced Magicians, Ritualists, Authors..and Wiccan Craft Elders!! Not only that, it also puts on a jolly good show of pagan and esoteric bands/ music groups (often in 2 different stages). And then there is the big New age/ Occult/ Esoteric market – shops and stalls – selling everything from magic wands, crystals, cloths, art works and more. The whole of Fairfield Hall (big place) in Croydon is booked for this annual Witchy extravaganza – and if you do down to Croydon town on that day, you are bound to see lots of Witchy-looking people out and about 🙂 There’s also usually the protesting Christian groups (handful) outside the Hall – presumably fearing for all the witchy souls and wanting too rescue us all. There are more talks and workshops than ever before given by the most famous Witchcraft/Wiccan authors and experts in the world. This page will be updated regularly with the latest confirmed speakers, artists and workshops. Wand Workshop -Learn to make your own magical wand. *NEW* Wiccan Apprentice Course in London -Starts soon! *NEW* Wiccan Apprentice Course in London – 3 month outdoor Training with 6 sessions – Starts on 27th April 2014! One of the challenges newcomers, Seekers & Explorers of Wicca & Witchcraft traditions face is – they can’t either find or pin down an experienced Wiccan Coven Leader(s) – and learn The Craft in the traditional apprentice manner! People just about find `Intro Courses’ that are 4-5 hours long in an indoor hired venue – where a Tutor gives explanations and a few meditations. This one is different. Why? Because it’s facilitated by a Wiccan High Priest (Mani) with nearly 2 decades of Craft & Coven experience. (There – no hiding!) And it’s facilitated by someone who has actually been not just running rituals (10 yrs), but outdoor Courses & Workshops regularly. What’s more, this is not just a sit-down-listen to explanations & go home course. This takes place outdoors – out in the elements and whatever weather that nature may come up with on a day. (Been there many times!) It immerses the Student-Seeker in nature. Well – isn’t that what being a true Wiccan / Witch is all about? This also is fully experiential, and spread over 5-6 sessions (session 6 is private and covers Covens & Initiations). You get to listen, learn, and practise – there and then! And this includes 2 full workshops – on making essential tools (Wands & Pentacles) and learning key magical techniques (Rune magic & Cord / Witches Ladder magic). All this in a natural vast woodland in London- with plenty of other facilities (Car park, toilets, Cafe, 5 minute walk from a Tube station). So all that you are learning – Apprentice-style- is imbued with the energy of nature! You can’t escape it – even if you try!! You will learn the foundations of Wicca, Principles & laws, practise setting up Altars & Consecrate space, do Circle casting, invoke Elemental Quarters & raise energy in the group / Circle with Witches Rune/ Chants, learn Invoking the Horned God & Triple Moon Goddess. You will also learn about doing Magic and create essential Wiccan tools (wand, Pentacle, Rune Magic & Cord Magic). Attend any 1 Session or 1 workshop. That’s quite a lot – for 5 sessions (each will be about 4 hrs)! *There is a 6th session, FREE but that’s by invite only, and to those who will have attended 3 or more sessions, or those who are doing our home study e-Witch Apprentice course by e-mails, or those who have purchased our `Cven Guide: Become an initiated Witch’ [well, we like to reward the Seekers & Students who are learning with us in other ways too ]. As a Wiccan High Priest, I look forward to serving you – as you explore your wiccan path. 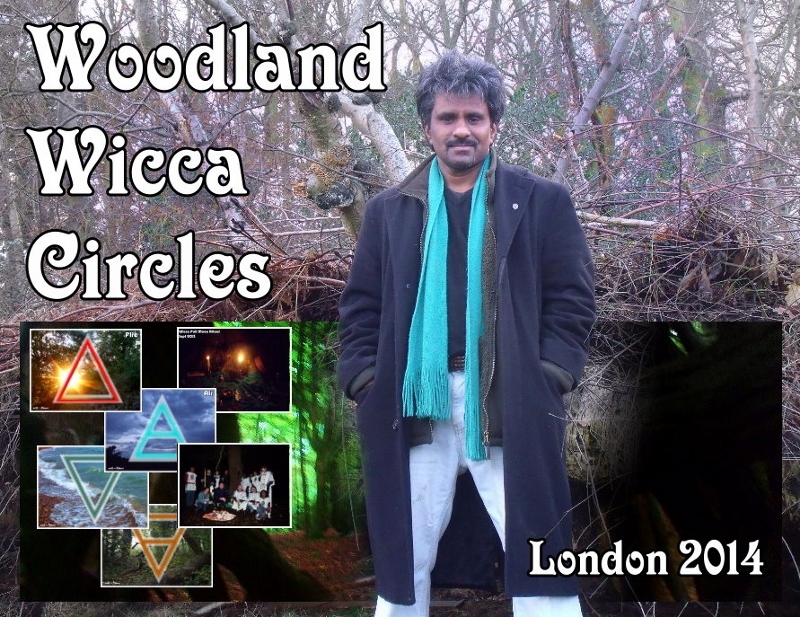 Mani Navasothy – Wiccan High Priest – invites interested pagans and Wiccan, Witches and Seekers of The Craft to monthly woodland wicca circles (rituals ) in London. These take place on the 2nd Sunday of the month (usually near a Full moon) and use the formal Wicca ritual format of consecrations, Circle Casting, calling quarters and invocations of deity. There is usually a meet-up in a public place where new guests are collected from..and we then go to the selected spot in the woods for the actual ceremony. Afterwards, we return to a warm, sociable venue such as a cafe or pub, and continue socialising. 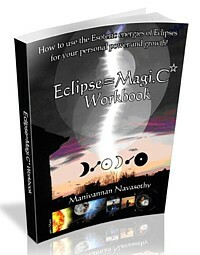 Mani Navasothy (lead facilitator) is happy to offer some mentoring, wicca training, and to those serious, an apprentice-style support via e-mail. 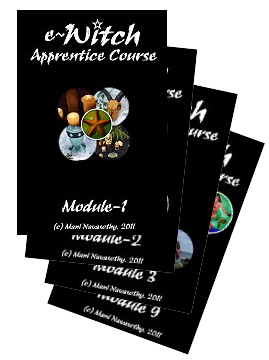 Those who can not make these but like to explore Wicca & Witchcraft can visit the website and undertake the e-Witch apprentice Course (in 9-13 modules). Video made for http://www.Witchcraftandmagic.org . 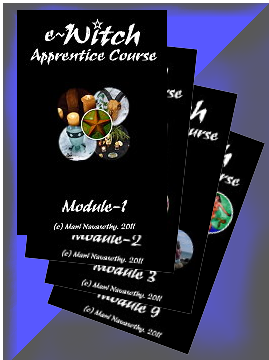 The e-Witch Apprentice course combines nearly 15 years of my personal experiences. This extensive e-course is packed with numerous bits of information, explanations, ritual and meditative exercises, photo-guided instructions on making tools, audio-video clips and tutorials – all of which are created by myself – with newcomers and beginners in mind. No previous experience necessary but a commitment to continue the course, as well as being self-disciplined will provide the Students with a strong foundation in Witchcraft, Wicca & Magic. –> 9 modules covering Basic introduction to Self-Initiation stage. 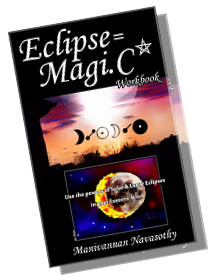 –> Modules have extensive info & contents, with explanations, practical magical & ritual exercises and written tasks to complete. –> Modules can be completed 1 per month, or at your own pace. Ritual & Magical work –. Alignment, Cycles & Record keeping. Module 1 (details): Modern Witchcraft (Wicca) and its origins; Personal Influences, motivations & expectations; Wiccan laws and principles; Altar preparations; Make a Broom and perform a magical Sweeping ritual. ; `Letting-go’ ceremony; Aligning with natural and personal cycles; Prepare your Book of Shadows; Magical candle- preparations, consecration; Attunement to nature; Begin personal energy work; Mirror-meditation ( transpersonal). Module 2: Foundations of Wicca; Building altars; Making a magic Wand; Consecration of tools; Cakes & Wine blessing; Chakra energy; Quest for an Athame (witch’s knife); God & Goddess; Personal myths. 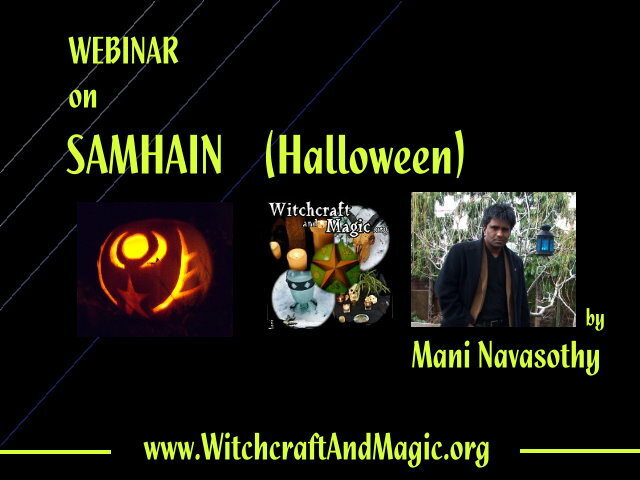 Here is a special 75 minute (edited) replay of last year’s popular Samhain Webinar! Follow this link to listen to the Samhain-Halloween Webinar with slideshow. I talk extensively about Samhain, and also covers introductions to Paganism, Wicca, Altars, outdoor rituals..and answers questions from listeners. I hope you enjoy this informative webinar. If you have new questions, e-mail them to me (via my website contact point) and I will personally get back to you. What’s a webinar? Well, it’ an online seminar, with a slide show, and a soundtrack (live talk). It can be accessed by a website (watched on a screen in a web page, with volume turned up), or it can be listened to via a phone-in (participants phone a pre-publicised local number, and put a pin number in and get their call connected to the webinar …and listen in. These used to be called `Teleseminars’ (telephone seminars), but now we have slides to go with them on websites…so they are more evolved and called `Webinars’. Various hosting companies provide the online services for registering & running webinars. (bit like website hosting). Webinars are highly evolved online communication, promotion & teaching tools…used for internet ventures & marketing. This webinar was originally facilitated on 31st Oct’2011. It originally came about because I was invited to appear in an internet radio show, to talk about Samhain, and also participate in a religious discussion about Halloween (in October 2011). However I was quite disappointed by the way my side of things (on Paganism) was warped by one of the other guests on the show – a Christian Priest. So, I made a big decision to start putting out the `uncensored’ version of my views… and my sister helped me set up this webinar. It was the first ever webinar I had done.. (and I had a very bad cold when I was doing it).